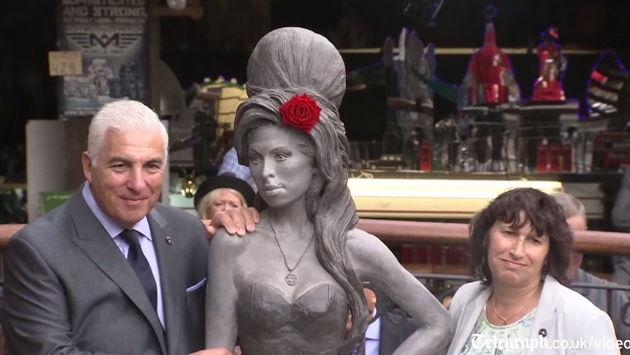 Fans and loved ones can now pay homage to Amy Winehouse by visiting the statue placed in her honor at Camden's Stable Market (London, England). BBC News reports the singer who passed away from “accidental alcohol poisoning” in 2011 was immortalized on Sunday in an area her parents proclaimed she loved very much. The Telegraph captured the poignant moment in the following video that features thoughts from Winehouse’s father, Mitch. An emotional Mitch Winehouse, joined by Amy’s mother Janis, explained the emotional moment that came on, as BBC News reminds, what would have been his daughter’s 31st birthday. That point is hammered home with what is a classy and rather stunning take on the singer in the form of a Scott Eaton sculpture. Winehouse’s life was cut far too short, but her legacy and impact will live on, in songs that continue to stream to millions and one captivating sculpture that embodies the artist in so many wonderful ways.